Brunch gets more airtime than Donald Trump and dinner is a must, you know, because of that whole dating thing. Or that whole networking thing. Wait, aren’t they the same? 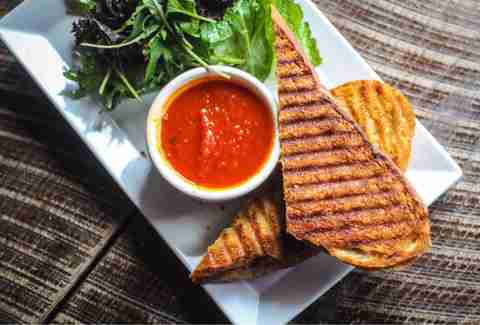 What doesn’t get enough love is lunch -- a prime opportunity to experience fancy-pants restaurants for less, or toss down something quick without sacrificing quality. 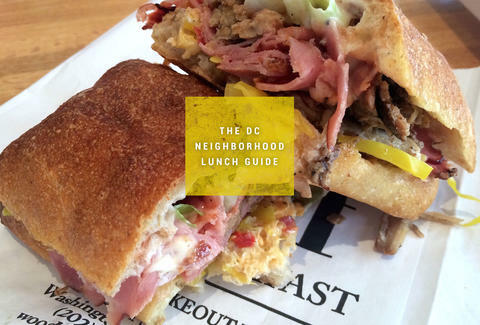 Here are the best places to head midday in 17 DC neighborhoods. 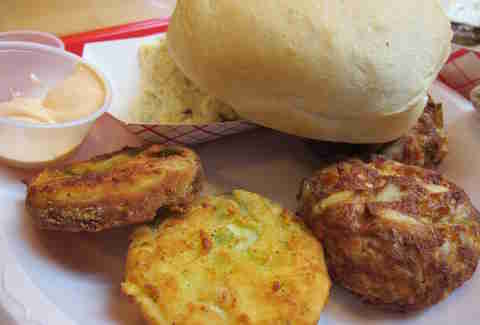 “I get the hype,” you’ll likely utter after your first bite of the Chick Chick or the Piggly-Wiggly (pictured). The latter packs smoked ham, pork shoulder, pimento cheese, chow-chow, and bacon aioli on ciabatta for a Cuban sandwich-meets-the South filler-upper. The sandwiches are superb, especially when paired with pistachio lemonade. See if you can escape without bringing baked goods back to the office to win your boss’ good graces and overlook the cheesy “WTF Is for Lunch” slogan. Woodward Takeout Food is open weekdays from 7:30am-4:30pm. Remember to call mom after you leave Beefsteak to tell her you ate all your vegetables and you didn’t hate it for one second. 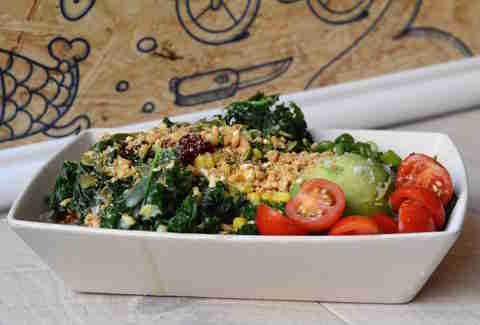 The nature’s candy-focused restaurant from José Andrés features blanched veggies, healthy grains, and killer toppings. If decision making requires a Xanax for you, opt for one of the predetermined bowls with cheeky names like the Kimchi-wa or Frida Kale instead of building your own. Beefsteak opens for lunch daily at 10:30am. (Insert stoner joke). Okay, let’s move on and talk about this Lebanese eatery and food truck. If you’re in Georgetown, you’re probably on the go looking for the Frye boots that will define your social status senior year, so you don’t want a long, ornate lunch. 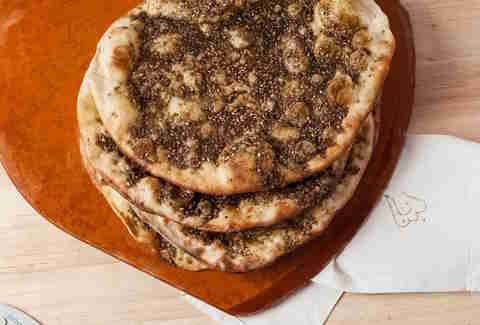 Enter Muncheez, which serves up shawarma, mankeesh, salads, mezze, wraps, pizza, and more. Big Lebowski fans should order “The Dude” pizza, while anyone in your group who actually utters the word “’Muricah” should get the brisket cheesesteak wrap. Muncheez opens daily at 11am. Maybe you’re one of the 10,000 overachievers who woke up this morning and ran six miles before the sun even showed up. Or better yet, you’re in the November Club. Reward yourself with a Red Apron Butchery sandwich because you’ll replenish those spent calories in no time. Chorizo burger? 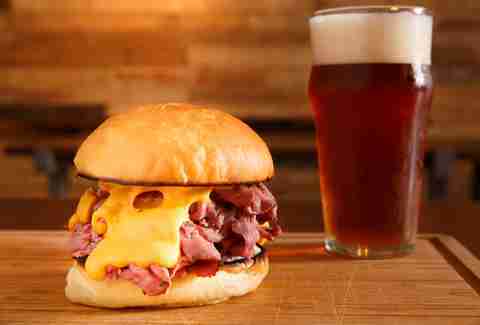 Beef & cheddar? Porkstrami? Yeah, looks like you’ll have to make multiple visits. And as if we had to tell you, beef-fat fries. Weekday lunch is served from 11am-2:30pm. Impossibly addictive double-fried wings? Yes, please. The $9 lunch deal gets you your choice of wings, drums, strips, or a combo in the flavor of your choosing, plus a side such as kimchi coleslaw or fries. You’ll leave full, happy, and sticky, so get off your “death to chain restaurants” soapbox just this once. 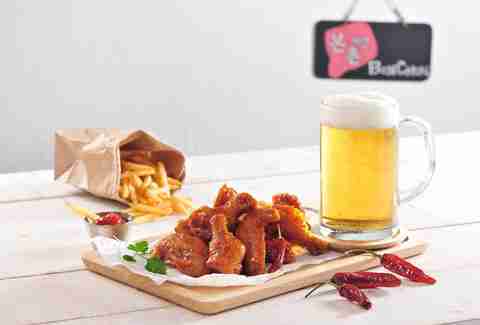 Bonchon Chicken opens daily at 11:30am. Lunch at Sushi Taro is the stuff dreams are made of -- maybe even Jiro’s dreams. That’s because a midday meal is the most economical way to experience DC’s iconic Japanese restaurant. 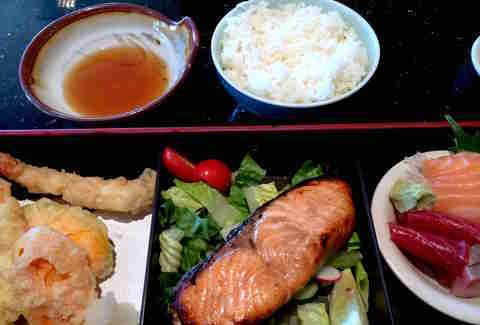 Bento boxes with sashimi and tempura among other things run $12.95. Or tried cooked entrees like pork katsudon or udon noodles, which also clock in at $13 or less. This is not a secret though, so make a reservation if you’re better at commitment than The Bride and Bill. Lunch is served weekdays from 11:30am-2pm. You know when you download the song whose lyrics you’ve been stalking and then you binge listen for a week only to be nauseated by said song two weeks later? No matter how many times you hit up Cava Grill this will not happen to you. 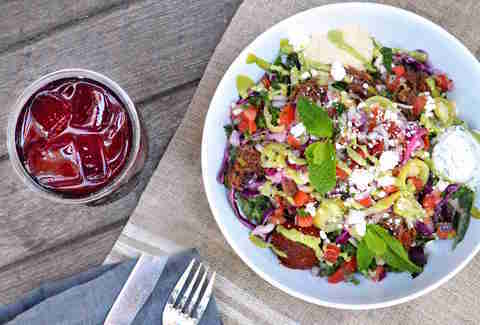 Bop back and forth between salads, rice bowls, and pitas punctuated by proteins like lamb sliders grilled feet away from the assembly line. Then load up on scoops of zesty dips like hummus and tzatziki, or bring the heat with harissa. Its proximity to the Verizon Center means an awesome pre-game or pre-movie meal (that might fit in your purse, but we didn’t say that). Cava Grill opens daily at 11am. “More than blueberry pancakes” should be the Market Lunch slogan come lunchtime. That’s because the crab cakes, oyster sandwiches, and no-frills burgers are classics. Add a side of fried green tomatoes FTW and look up from your phone because you never know who you might be rubbing elbows with at the communal table. Market Lunch, inside Eastern Market, is open from 7:30am-2:30pm Tues-Friday; 8am-3pm Sat; and 9am-3pm Sunday. The often reiterated tip of hitting Toki Underground for lunch instead of dinner to avoid lines rings true. But there are other pluses, like the fact that you’ll feel full enough to require only a liquid dinner of happy hour beers. 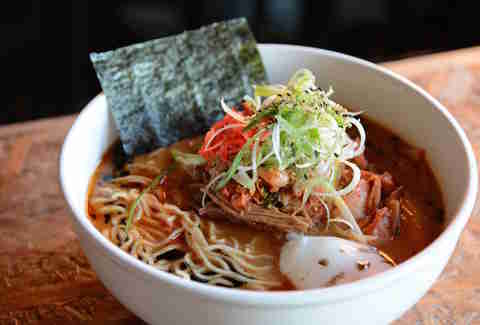 Get your daytime ramen fix Monday-Saturday starting at 11:30am. Flavors these days include Toki classic, Taipei curry chicken, vegetarian, red miso, and kimchi (pictured). You like breakfast for lunch on days other than Saturday and Sunday? Room 11 has your back. You like day drinking with lunch? Yep, it's got that too, and don’t forget the top-notch coffee program. Try the Room 11 grilled cheese washed down with locally produced Thunder Beast root beer for a taste of childhood, or go grown-up with the bleu cheese biscuit burger paired with the IPA of the day. The charming space is filled with light, not Wi-Fi, so expect to read a book or converse. Room 11 opens daily at 8am. 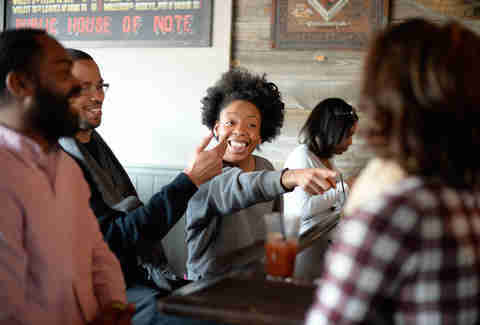 It know it's rocking the best lunch eats in the neighborhood with a name like Brookland’s Finest. It would be braggadocio if it weren’t 100% true. How about a porchetta sandwich with suckling pig, sausage, arugula, mozzarella, and mustard on a pretzel bun to break up your day? 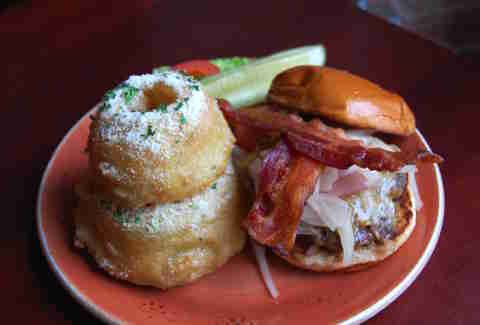 The Colonel burger (pictured) with tempura onion rings is also a hit. Make it a working lunch thanks to Wi-Fi and strong coffee. Brookland’s Finest opens at 11am weekdays and 10am on weekends. 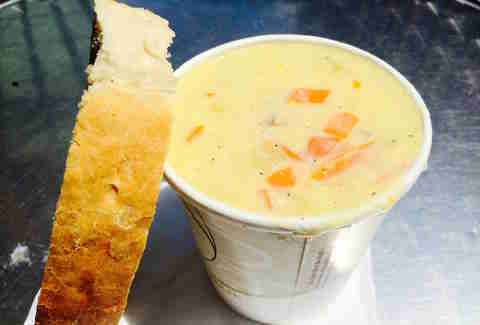 Home to one of DC’s signature dishes -- avgolemono soup -- Greek Deli is an institution that has been drawing lines since 1990. Owner Kostas Fostieris’ service is warm but brisk so stop comparing him to Seinfeld’s Soup Nazi. Especially since that episode didn’t air until 1995. Be sure to try his lamb souvlaki, pastitsio, and believe it or not, green beans. Greek Deli is open weekdays from 7am-4pm. Find yourself in Upper Northwest during the day? 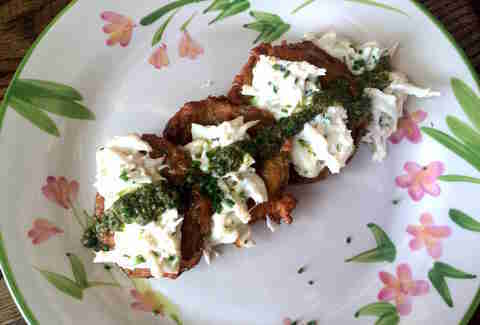 Treat yo self to a Southern snack like fried green tomatoes topped with deviled crab (pictured) before moving on to a mammoth burger or a simple-but-tasty city ham sandwich. Don’t bother saying you’ve eaten at Macon unless you’ve ordered Essie’s biscuits with honey butter and pepper jelly. Just don’t. Spring for a lemonade because somehow it’s in a league of its own. Lunch is served Tues-Friday 11:30am-2pm. 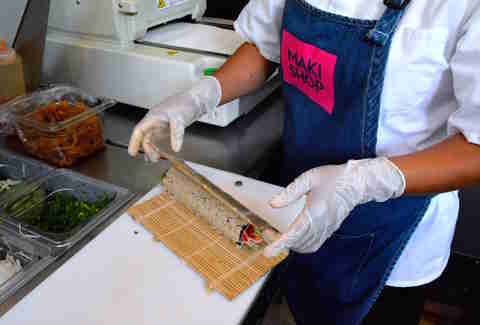 You can get in and out of Maki Shop in five minutes with rolls in hand. Yes, rolls, plural, because one is not enough to fill you up. We tried, then hit the office vending machine HARD. You don’t need chopsticks for the rolled maki, just follow the unwrapping instructions and dip away in sauces from the sauce bar --the most addictive of which is Sriracha mayo. Because Sriracha. The sauces may not be authentic to Japan, but that’s where the resto gets its rice-rolling machines. Try the California crab, poke tuna, and beef short rib. Maki Shop opens daily at 11am. It’s a shame your only memories of Boundary Stone are hazy thanks to the fine whiskey selection because the food is tasty too. Fix that by popping into this beloved watering hole while the sun’s still out. It serves lunch starting at 11am and follows the something-for-everyone approach. You’re starting with fried pickle spears and honey hot wings before a grand finale of a chili-cheese half smoke or a DC Brau chicken sandwich. It will take you four workweeks to make your way through SUNdeVICH’s globally inspired menu of 20 sandwiches. Challenge accepted? We thought so. 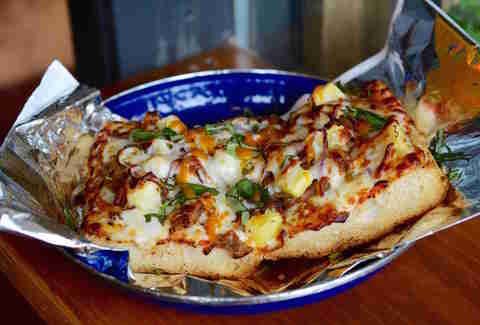 Start with the signature Kingston, which, you guessed it, is filled with jerk chicken and maybe even reggae music. 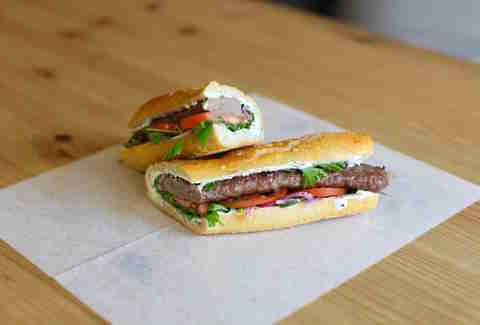 Also good: the Istanbul that’s basically a gyro. Don’t forget that four of the 20 sandos are of the breakfast variety, like the Mexico City with ham, avocado, eggs, tomato, and chipotle butter, and they’re available all day long. SUNdeVICH opens daily at noon (closed Sundays). You’d have to be fresh to DC to call Adams Morgan a daytime destination, unless you count the MacBook Air‎-toting tribe of teleworkers headed to Tryst. But a few spots have cropped up lately making heading up 18th St for lunch quite appealing, like Donburi and Songbyrd Record Cafe. The latter got a lot of buzz for its DC Frankenfood -- the Mumbo slice -- but also try the Kraftwerk with chicken schnitzel inside and any of the burgers as you take in some vinyl. Songbyrd Record Cafe opens daily at 10am (closed Monday). Laura Hayes is a DC-based writer and lunch enthusiast. See what she’s been eating: @BTMenu.